Thanksgiving is one of my favorite holidays, probably because the whole thing basically revolves around food. I love all the traditional Thanksgiving recipes, except of course those heavily laden with dairy. 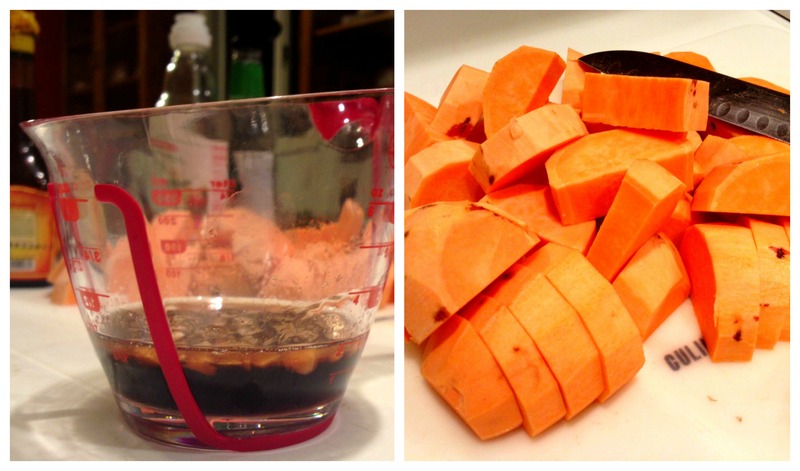 Sweet potatoes are always my favorite part of the meal. I love them baked with marshmallows, mashed, and/or in pie. Typically sweet potato recipes are sweet, almost to the point of being desserts. One of my favorite preparations though is a savory take on this vegetable that would add some nice variety to your Thanksgiving table. Preheat oven to 400 degrees. In a large bowl combine the sesame oil, brown sugar, rice vinegar, minced garlic, soy sauce, and water. Spray baking dish well with non-stick spray or olive oil, using a dish with a lid if you have one. 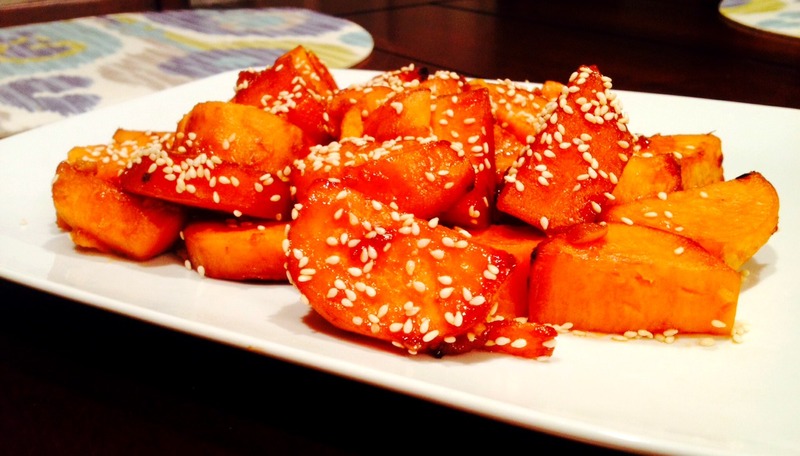 Peel sweet potatoes and cut into half moons. Aim for same-size pieces, about an inch thick. 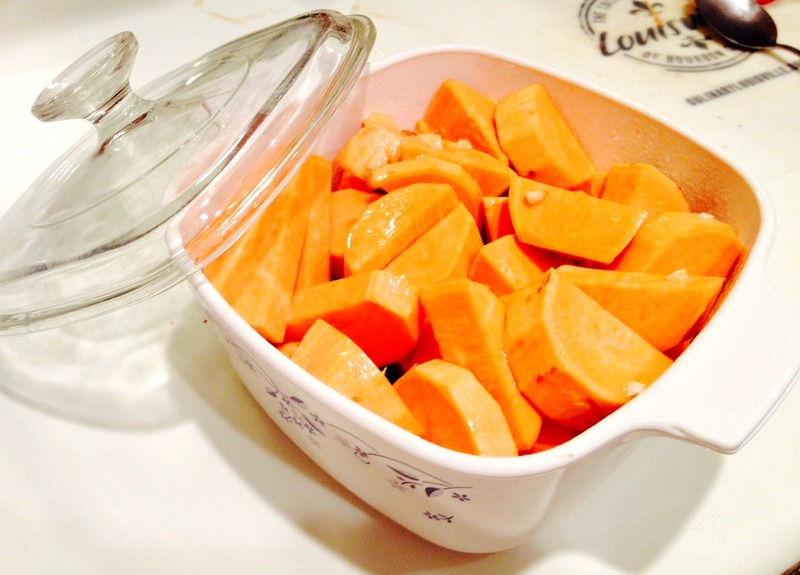 Dump your sweet potato pieces into your large bowl and stir with a large spoon until the pieces are well-coated. Pour everything into a baking dish with a lid, cover, and bake for 20 minutes. If your dish does not have a lid, you can simply use tinfoil. Remove cover and stir potatoes, then pop back in the oven for 10 minutes. Note, do not put the cover back on. After 10 minutes, stir the potatoes again; continue to bake and stir in 10 minute increments for about 30 more minutes. The potatoes are done when they can be pierced with a fork and the liquid has been absorbed. Garnish with sesame seeds and serve hot. *Note, this recipe will likely get the sides of your baking dish really black. If you hate scrubbing the dishes, you can line your dish with tin foil; just be careful when stirring the potatoes so the foil doesn’t rip. Let me know if you give this recipe a shot. 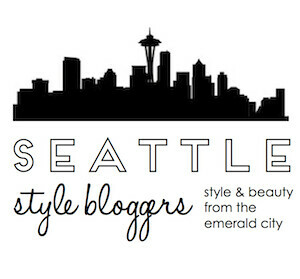 You won’t regret it, I promise! Sounds good! I’ll try it.